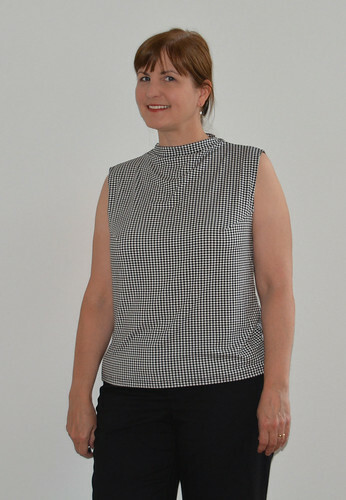 I made this top from Kwik Sew 2844. I've had the pattern for so long now that it is out of print. It was a really simple thing to sew, just two pattern pieces and only shoulder, side seams and hems to worry about. However, when I put it on I had quite a bit of gaping in the front armholes and my bra was visible. Not good, but sadly also not unlike what I see a lot of women wearing. This pattern and, in my opinion, a lot of cheap RTW clothes like it, are not designed for someone with breasts! I wasn't going to wear it as-is nor did I want to throw it away, so I made bust darts to close up the gap and make it fit better. And yes, I do seem to be in a black and white phase - out of the last five things I've made, four have been black and white. There is more colorful fabric in my sewing queue. Fabric Used: 4-way stretch cotton lycra, with perhaps a bit too much stretch for this pattern but since I ended up making it less-snug the fabric drapes rather than clings, which is a good thing! I've had this fabric for a long time too, almost as long as the pattern. Did it look like the photo/drawing on the pattern envelope once you were done sewing with it? Yes, but I left off the front pocket and added darts. Were the instructions easy to follow? The pattern is only two pieces (three if you include the pocket). I used my serger 4-thread overlock for the shoulder and side seams and cover stitch for the hems. I used fusible straight tape for the shoulder seams, as I do on all knits. I also cover-stitched the funnel neck hem, although the instructions call for just turning the facing over and securing it at the side seams only. A beginner can follow the instructions but they may be a bit confusing because they have you jump all over the place since parts of the instructions apply to the different views. What did you particularly like or dislike about the pattern? I liked the simple lines, wider shoulder (hides the bra-strap well), and I think the funnel neck is a nice change from a plain round or jewel neck. I've had this pattern for a long, long time. I'd envisioned it in the fabric I eventually made it in. Pattern alterations or any design changes you made: I added the bust darts after I'd sewn it up. My measurements put me between the medium and large sizes in Kwik Sew, but the large ended up a bit too big and I had major "gap-osis" in the front armhole. I pinned out the excess into a dart and adjusted the hem of the armhole as best I could. Since the shoulders were a bit too wide as well so I had to adjust the armhole hem anyway. In hindsight I maybe should have started with the medium and done a FBA and added a bit to the waist. Would you sew it again? Would you recommend it to others? I may make this again - with darts. Or I may experiment with the medium size and a FBA. Since I've never done a FBA, this may be a good pattern to try it on. Conclusion: The top turned out really comfortable. I shouldn't have waited so long to make it!